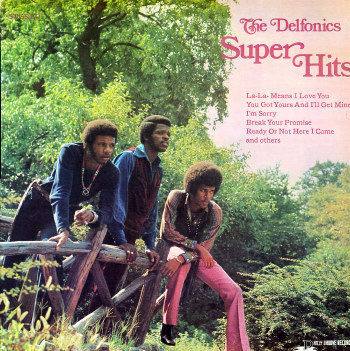 The Delfonics — issued in January 1968 on Philly Groove 150, b/w “Can’t Get Over Losing You” (Bell, Hart); chart success: #4 US pop,#2 R&B in 1968. The same two titles had previously been released as Philly Groove NS-1001 / NS-1002, in December 1967, with William Hart credited on each side as the lone songwriter, and Thom Bell credited only as arranger on each side. I don’t know if the credit changes on the January 1968 issue indicate modified music and/or lyrics, omissions on the earlier label, or a business decision. 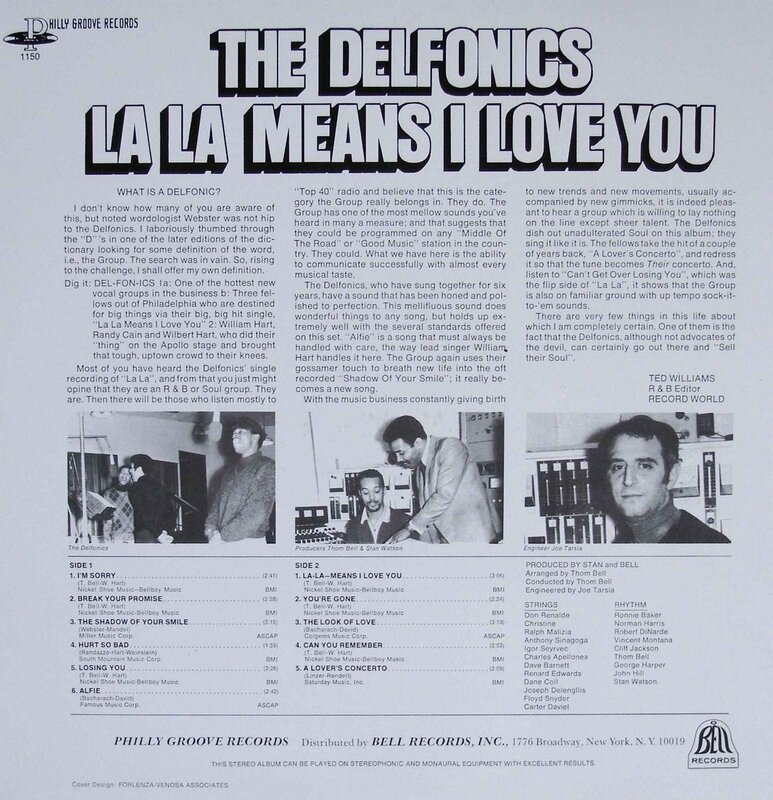 “La-La Means I Love You” is also the title track of the debut LP by the Delfonics, released in May 1968. The album version is slightly longer (14 seconds) than the hit single. In the UK, the single was originally released, with the same flip side, on the Bell label as BLL 1005 in March 1968, then reissued as BLL 1165 in June 1971 (#19 UK pop hit, 1971). The Delfonics — Philly Groove single #161, b/w Down Is Up, Up Is Down (Bell, Hart), released December 1969 (according to 45cat.com, though other discography sites date it 1970). Arranged and conducted by Thom Bell, produced by Stan Watson and Thom Bell. Chart success: US #10 pop single, and #3 R&B in 1970; #22 UK pop single in 1971. The recording also became the initial track on side one of the group’s self-titled third album, released in July 1970. 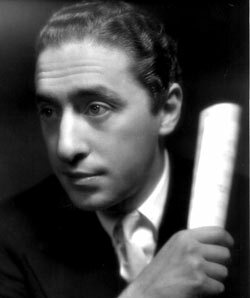 * Though 45cat.com displays a label crediting only “Wilber Hart” (name misspelled) as the writer of “Hey! 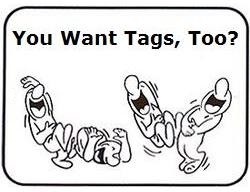 Love,” some sites credit Wilbert Hart and Karl Chambers. Discogs.com displays a few labels with only “Wilber Hart” (misspelled) credited (1) (2), and at least one label with “Wilbert Hart-Karl Chambers” credited. 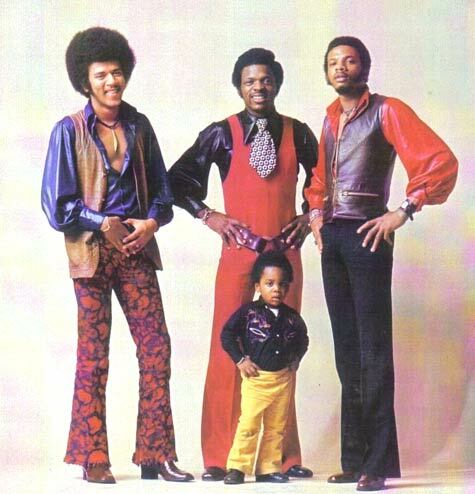 The group split around 1975; one group featured Major and Wilbert, with new member Frank Washington, formerly of the Futures. 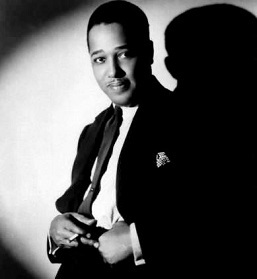 (Major Harris also had major success with the solo recording “Love Won’t Let Me Wait”). The other group featured William with new members. Lineups would become confusing as members shifted between groups and multiple groups toured. Major Harris moved to William’s group around 1980, with their third member being the returning Randy Cain. Frank Washington also switched from Wilbert’s group, joining in 1985. See also parts 2, 3, and 4.